Since version 8.89 of Logitech Gaming Software, you can create frame-by-frame RGB lighting animations on your compatible keyboard. That’s cool but Logitech’s Lighting Effects Editor doesn’t make it easy to work with more than a few colors at a time and you must apply the colors to the keys one slow click at a time. 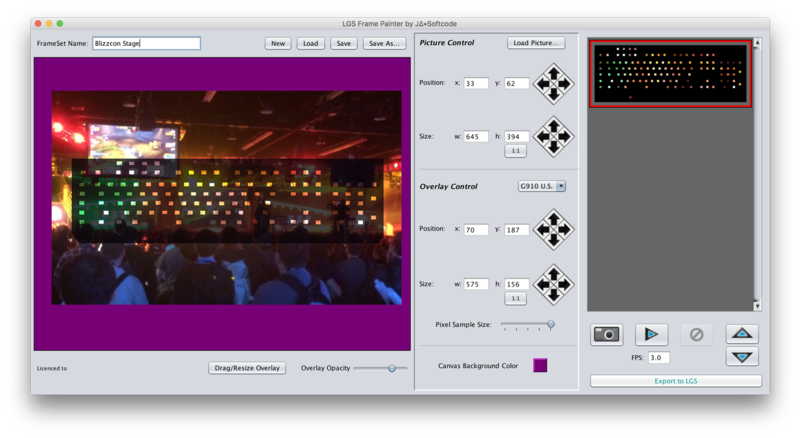 ﻿Frame ﻿Painter ﻿for ﻿LGS ﻿will ﻿take ﻿any ﻿JPEG, ﻿GIF ﻿or ﻿PNG ﻿and ﻿instantly ﻿show ﻿the ﻿colors ﻿of ﻿that ﻿image ﻿on ﻿your ﻿Logitech ﻿RGB ﻿keyboard. ﻿Paint ﻿your ﻿entire ﻿keyboard ﻿in ﻿a ﻿wash ﻿of ﻿diverse ﻿new ﻿color ﻿with ﻿a ﻿few ﻿clicks. ﻿The ﻿size ﻿and ﻿dimensions ﻿of ﻿the ﻿picture ﻿mapped ﻿onto ﻿your ﻿keyboard ﻿lights ﻿are ﻿infinitely ﻿adjustable. ﻿Variable ﻿color ﻿sampling ﻿lets ﻿you ﻿choose ﻿how ﻿smoothly ﻿or ﻿precise ﻿each ﻿key ﻿maps ﻿to ﻿the ﻿colors ﻿in ﻿the ﻿imagee. ﻿The ﻿115 ﻿keyboard ﻿lights ﻿may ﻿be ﻿too ﻿few ﻿and ﻿oddly ﻿spaced ﻿to ﻿render ﻿a ﻿photo ﻿clearly ﻿but ﻿with ﻿Frame ﻿Painter ﻿for ﻿LGS, ﻿you ﻿can ﻿easily ﻿unlock ﻿the ﻿full ﻿color ﻿potential ﻿of ﻿your ﻿keyboard. ﻿Frame ﻿Painter ﻿for ﻿LGS ﻿captures ﻿all ﻿the ﻿rich ﻿colors ﻿from ﻿a ﻿photo ﻿and ﻿gives ﻿you ﻿total ﻿flexibility ﻿about ﻿how ﻿to ﻿spread ﻿the ﻿colors ﻿across ﻿your ﻿keyboard. ﻿Zoom ﻿into ﻿one ﻿spot ﻿of ﻿interest, ﻿or ﻿soak ﻿in ﻿the ﻿beauty ﻿of ﻿the ﻿entire ﻿sunrise ﻿sky. ﻿Frame ﻿Painter ﻿for ﻿LGS ﻿(FP4L) ﻿makes ﻿creating ﻿an ﻿animated ﻿light ﻿show ﻿as ﻿easy ﻿as ﻿dragging ﻿your ﻿mouse. ﻿Scale ﻿and ﻿stretch ﻿the ﻿picture ﻿on ﻿your ﻿keyboard ﻿and ﻿capture ﻿a ﻿frame. ﻿Then ﻿shift ﻿the ﻿position ﻿and ﻿capture ﻿another ﻿frame. ﻿Shift ﻿again. ﻿Capture ﻿again. ﻿In ﻿no ﻿time, ﻿you’ll ﻿have ﻿an ﻿animated ﻿light ﻿show ﻿for ﻿your ﻿keyboard! ﻿Export ﻿your ﻿video ﻿as ﻿a ﻿series ﻿of ﻿pictures ﻿using ﻿another ﻿program. ﻿Load ﻿the ﻿first ﻿image ﻿into ﻿FP4L, ﻿adjust ﻿the ﻿position ﻿and ﻿scaling ﻿to ﻿look ﻿good, ﻿and ﻿capture ﻿the ﻿lighting ﻿frame. ﻿Then ﻿click ﻿the ﻿new ﻿Load ﻿Sequence ﻿button, ﻿select ﻿all ﻿the ﻿remaining ﻿pictures ﻿from ﻿that ﻿video, ﻿and ﻿FP4L ﻿will ﻿create ﻿frames ﻿for ﻿all ﻿of ﻿them. ﻿It ﻿turns ﻿your ﻿RGB ﻿keyboard ﻿into ﻿a ﻿micro-Jumbotron! ﻿Preview ﻿the ﻿animation ﻿directly ﻿in ﻿FP4L ﻿and ﻿adjust ﻿frames ﻿until ﻿it’s ﻿perfect. Once your frame sequence is complete, click the Export button to create a file ready to import into LGS’s "Your Effects” editor. There, make finishing timing and transition adjustments and apply your new animation to any LGS profile to enjoy all across your system. Try it out for free today! Frame Painter for LGS does not function with Logitech’s new G HUB software. As of September 2018, G HUB does not allow you to import light animation (.eft) files from your hard drive but only from their internal sharing site.